Although you can sit and even lay down on mattresses in a furniture store showroom, the professionals at Weekends Only Furniture & Mattress know you won’t truly get a feel for your new mattress until you take it home. Their knowledge comes from almost 20 years of experience providing residents in the greater St. Louis area with top-quality mattresses. To make sure you are satisfied with your purchase, the company offers a 60 Nights Comfort Guarantee. After you purchase your new bedding from the Fairview Heights, IL-based store’s extensive inventory of mattresses, you can take home your new mattress for a 60-day trial run. The team at Weekends Only Furniture & Mattress believes it takes 30 days for your body to adjust to a new mattress. These caring professionals want to make sure you wake up well rested every morning, which is why they give you an extra 30 days to adjust to your new bed. I f you still don’t like the mattress within 60 days of purchase, you can simply call customer service to arrange for an appointment to pick out a new mattress or merely return the old one. Weekends Only Furniture & Mattress values your business and won’t tack on extra charges for the exchange or return. All you have to pay is the redelivery fee. If you opt for a less expensive mattress, the St. Louis area’s leading bedroom furniture store will even refund you the difference. You must pick out the new mattress within 14 days of letting the company know you want an exchange. Some items are not covered by the guarantee, including floor models, clearance mattresses, and damaged mattresses. The guarantee also excludes mattress protectors, power and adjustable bases, and additional furniture and accessories. You shouldn’t have to suffer from an achy back and a lack of sleep because of a mattress you don’t like, and at Weekends Only Furniture & Mattress, you don’t have to! To learn more about the 60 Nights Comfort Guarantee, just call (855) 803-5888 today. 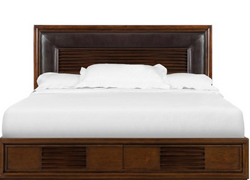 To shop the wide selection of bedroom and living room furniture and more, visit them online.